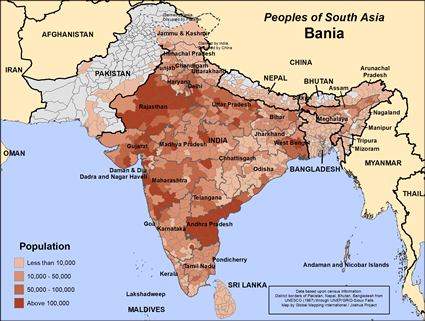 The Vania people are also called Bania or Mahajan. The word Vania is derived from 'Vaniji', which means 'trader' in Sanskrit. The Vania community has gotras (clans) such as Agarwal, Dasora, Dishawal, Kapol, Nagori, Vagada, Modh and Nagar. Many of these names are based on the names of the place they are from. The Agrawal, though they are settled mainly in North Gujarat, take their name from Agar Town. The Jharola live in eastern Gujarat and come from Jalor of Rajashthan and Maharashtra. The titles used by the Vania are Shah, Shroff, Parikkh, Chokshi, Seth and Gandhi. The Vania community consists of two religious divisions, namely Vaishnava and Jain. Most of the groups of Vania are split into Visha meaning twenty and Dasha or ten. These subdivisions are further divided into Ekda and Bagda. The Bagda mostly live in villages, while Ekda live in villages and towns. They have an organization called the Mandal to look after the temples and the community's property. Business, trade, jewellery-making and agriculture are the traditional occupations of the Vania. Floor painting and folk songs represent the Vania's art and culture. The naming of the newborn ritual is performed by a Jangam priest by putting a thread around the infant's neck. The Vania are Hindu by religion. They are Vaishnavite and devotees of Shrinathji. A section of them are from the Jain community. The Vania maintain intercommunity linkages with the Brahmin, Valand, Soni and other communities through trade and service. The Vania in the state of Maharashtra are mostly followers of the Lingayat religion. * For the salvation of the Vania people and that God may send several Christian workers among them and meet their spiritual and physical needs. * Pray for developmental and literacy programs among the people.